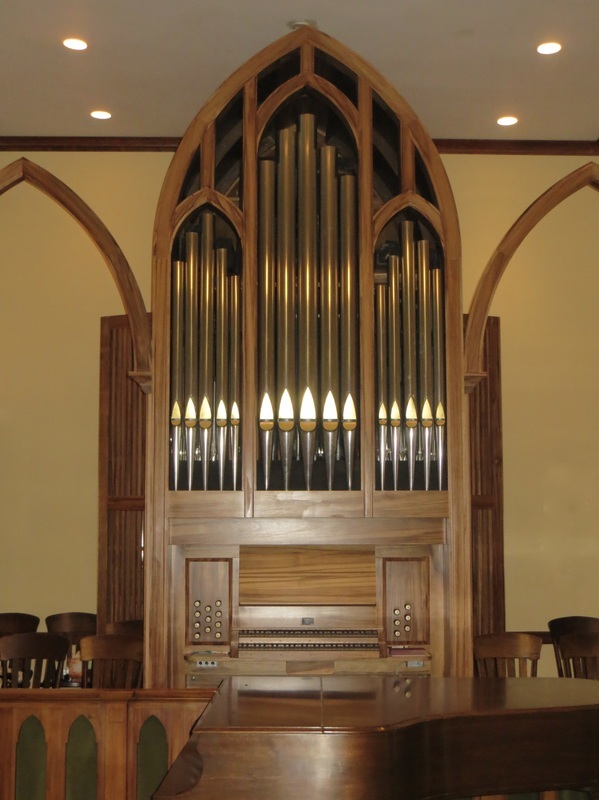 The organ of the Sumner Presbyterian Church is a tracker action pipe organ built by the Martin Ott Pipe Organ Company of St. Louis, Missouri. The members of our original Organ Committee were Mr. Robert K. Mehrle, Mr. Richard L. Parsons, Mrs. E. Leonard Patterson, Mr. R. Keith Turnipseed, Mrs. J. Stephens Worley and Mrs. J. J. Webb, II. The organ has 19 ranks and 16 stops, representing 898 pipes. The metal pipes were made in Europe, and the wooden pipes were built in St. Louis of white oak, cherry, and sweet gum. All of the pipes, with the exception of the fifteen facade pipes, are under expression. The organ case is constructed of Mississippi Delta red gum in three gothic arches, in keeping with the decoration of the church's Akron Plan Sanctuary, built in 1919. The keys of the console and the stop knobs are made of grenadil, and the sharps, as well as the stop knobs, are capped in bone. The five bells of the Zimblestem were made in Europe of cast brass. 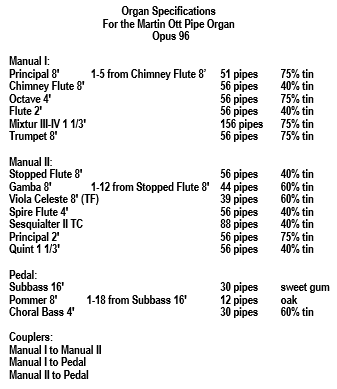 The specifications for our organ are shown below. Martin Ott, Orgelbaumeister (Master Organ Builder,) was born and raised in Gottingen, Germany, and comes from a family of distinguished pipe organ builders. Mr. Ott's father, Orgelbaumeister Alfred Ott, was his first teacher and remained an influence throughout his career. His uncle, Orgelbaumeister Paul Ott, was one of the primary organ builders in the revival of tracker-action organs in Germany. Beginning as an apprentice in 1960 and continuing into his Journeyman years (1964-1969), Martin Ott worked in Paul Ott's organ building company, and worked for a year with Walter Holtkamp, Jr. in the United States. In 1969, follow­ing a formal study at the School for Music Instrument Building in Ludwigsburg, Baden-Wurtternburg, he completed his Master Organ Builder examination. In 1971. Mr. Ott returned to the United States and, in 1973 established the Martin Ott Pipe Organ Company, in St. Louis, Missouri. The company has grown into a new 7,000 square foot facility specially designed for organ building. His instru­ments are found in 20 states across the U.S.A. Martin Ott's excellence in organ building has been recognized through the Music Industry Award from the National Association of Pastoral Musicians (1995) and the Avis Blewetx Award from the American Guild of Organist, St. Louis Chapter (1998).